On Mar 9, 2013, I delivered a talk for students of SMK Padjajaran, a new IT vocational school in Jatinangor, West Java. Knowing that the audiences are senior high school students, I should choose a light material. Yet, I decided to talk about a kind of new stuff in Windows Azure, Media Services, and taking the risk that nobody will understand what I was talking about. My objective is so that the youngsters aware of cloud computing in general, Azure specifically, since the beginning of their study and career path. Off course, it’s a challenge to talk about Azure to high school students, or even cloud computing in general. Luckily, the speaker before me, a fellow MVP, Bobby Zulkarnain, talked about Windows Server 2012. So, I started by saying that the Azure is some kind of Windows Server in the cloud, which the server hardware is not seen physically, but somewhere out there, connected to internet. That’s my starting point, and the audiences start to understand. Talking about Azure Media Services presented another challenge. I choose an analogy of publishing videos so that they can be viewed by a huge number of viewers. Instead of buying tons of hardwares, pay for huge bandwidth, and maintain and operate the infrastructure, why don’t lease ones. That’s basically Azure Media Services. Off course, it’s so much more than that, but at least I delivered my point to the audiences. I’ve said thanks to Xamarin. Since this is my first encounter with Xamarin, I have no idea what I’m doing. Let’s start with downloading and installing it. Nothing that made my day today but getting an email from Xamarin, offering me a free license of both Xamarin.iOS and Xamarin.Android Business Edition worth $1,800! It’s all started when a friend told me about Xamarin gift for Microsoft Most Valuable Professionals (MVP) on this blog post. I tried to request the access but keep my hope low since I’m kinda late knowing it. The offer ended at the end of February, while my request is sent on March. Three weeks passed by, suddenly got an email from Xamarin COO, Joseph Hill, told me that I and few other stragglers made him guilty enough to take care of the requests. One hour later, an email came containing instruction to download the product. Now, I’m installing it and will soon starting to play around with it. Will share to you how it goes. Again, huge thanks to Xamarin for this great community support. 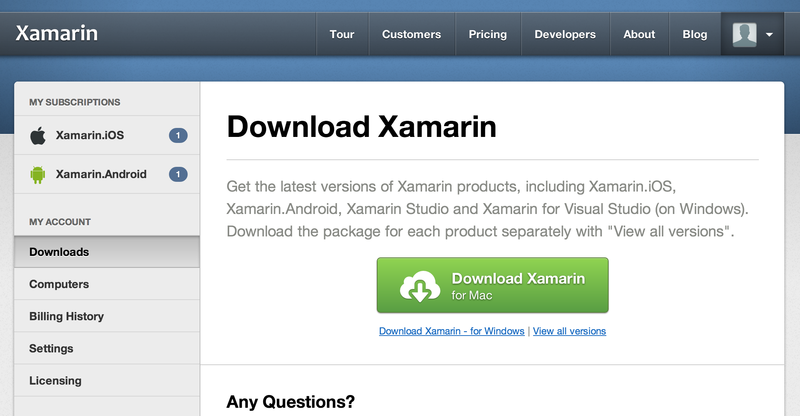 Posted on March 22, 2013 Categories iOS, XamarinTags MVP, Xamarin.Android, Xamarin.iOS1 Comment on Thanks Xamarin! As a addition to my post here, and Azure tutorial here. what if I want to shape the returned data of GET operation to certain table. If you look at SCRIPT menu on a table, you’ll find “Read” operation. Here where you can put server script to shape returned data. It said that @hackerspacebdg, a co-working space for creative (developers, designers, bloggers) freelancers and entrepreneurs in Bandung, organises a sharing event to talk about database design and optimisation. On the last minute I tell the organiser that I’d like to share about database backend for mobile apps. They say OK, so I join the force. Specifically I talk about Windows Azure Mobile Services that offers database-driven backend for mobile apps frontend, either for iOS, Windows Phone, Windows 8, or even Android. I choose specific implementation on iOS, since I do iOS app development almost everyday. As my post here, I shared a journey of creating, recreating, and deleting Windows Azure Virtual Machines in order to just install IIS. I need to rephrase here, that hassle is due to wrong selection of VM size. I rephrase, you need to choose at least the VM size of Medium (2 cores, 3.5 GB memory) in order to successfully install Windows Server OS and related services such as IIS. At least, that’s my experience at that particular time. During the journey, 3 VMs were created. As they won’t be used, they should be deleted so that we don’t have to pay for them. 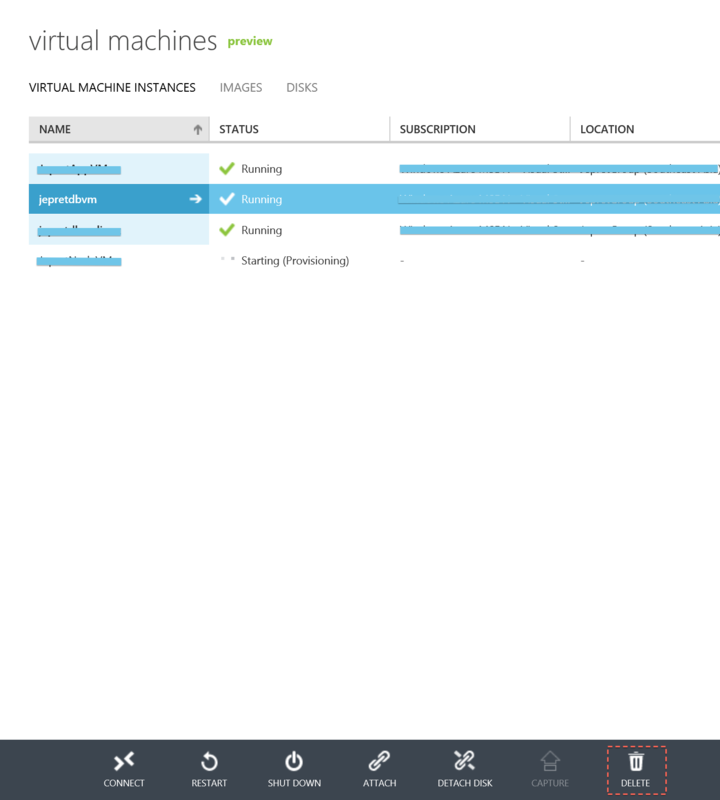 Turned out, deleting VM in Azure is kinda tricky. Obviously, logical step to delete something is selecting it, then find “delete” button. Click the button and choose “yes” when confirmation pops up.